Font: Use this to choose a font. If you prefer to use fonts specified by the reader's browser, select Variable Width or Fixed Width. Note: Not all fonts installed on your computer appear. Instead of specifying a font that may not be available to all who view your web page, it's generally best to select one of the fonts provided in the menu since these fonts work on every computer. 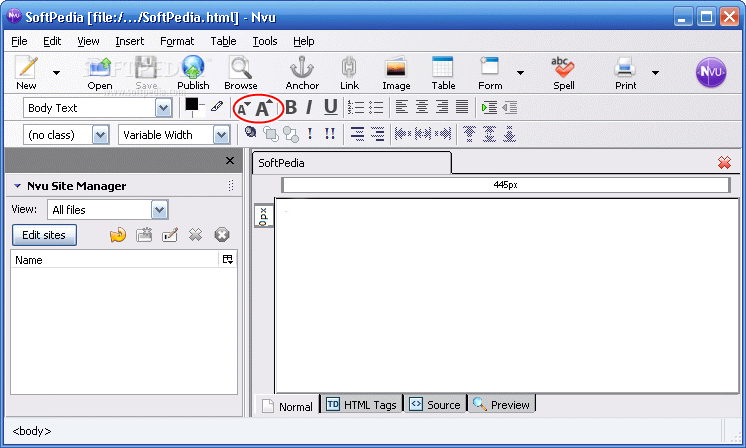 For example, the fonts Helvetica, Arial, Times, and Courier generally look the same when viewed on different computers. If you select a different font, it may not look the same when viewed using a different computer. Size: Use this to choose a relative font size or select an option to increase or decrease text size (relative to the surrounding text). Text Style: Use this to select a style, such as italic, bold, or underline, or to apply a structured style, for example, Code. Click anywhere in the page. Click the background color block in the Format toolbar. Choose a background color from the Block Background Color dialog box. Tip: To quickly change the color of text to the color last used, select the text, then press Shift and click on the text color block in the Format toolbar. This is useful when you want to use one color for separate lines of text.